Welcome back to our blog series on the home extension we completed in Clematis, Victoria. Today we’re focusing on the “lock up” stage. 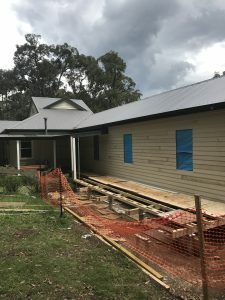 This is an exciting stage of any renovation or extension for both the home owner and the builder! Cladding is “the application of one matieral over another to provide a skin or layer”. they complimented the existing home to ensure the new extension didn’t look out of place. they complied with the BAL rating of the property. 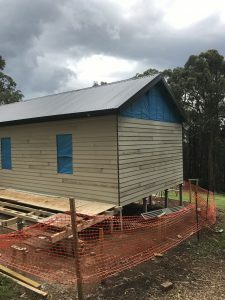 A BAL rating is used to establish the protection requirements for construction, should a bushfire occur. We wrote a blog post about this previously. The James Hardie Prime Line Cement Sheet Weatherboards are easy to install due to HardieLock™ fixing system. This system minimises the time needed for the builder to set the boards out. The HardieLock™ fixing system has a PVC lip which allows the top weatherboard to securely “lock” into the lower weatherboard. This provides the builder with less wastage and enhances the finished look. 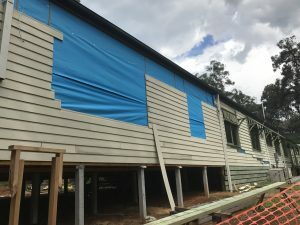 The windows of a renovation or extension are normally installed prior to the external cladding but for this renovation, the weatherboards were installed first as the windows had not arrived. 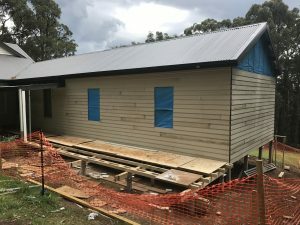 Once the weatherboards and windows are installed, a painter can work their magic and paint the weatherboards any colour you like! The roofing can be installed at any time during the lock-up stage. A licensed plumber installed a colour bond roof to match the existing home. Our final blog post in the series will be coming soon; “internal fit out”. This will give you an insight into last stage of the extension!